First time on the market for Boulder View at The Lodges at Eagles Nest. This 2018 custom built mountain retreat is in a prime Eagles Nest location only minutes from the gated entrance and around the corner from the Great Camp and Boulder Park. 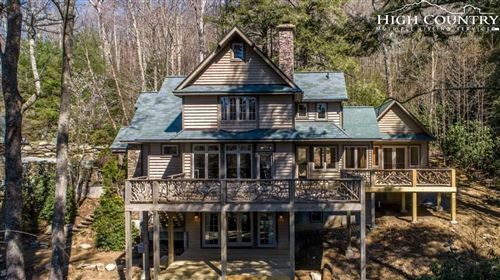 As you enter this rustic mountain retreat you are welcomed with an open great room with a 2 story stone fireplace and wall of windows and doors opening to the oversized open/covered back deck with mountain views. The gourmet kitchen is well appointed with beautiful granite, custom fixtures, and new appliances. The main level living features the private master suite with custom en suite bath. One will not overlook the amazing and well thought out details such as unique woods, custom trim work, built ins, and lighting, barn doors, custom tile work, and so much more. The spacious decking overlooks the beautifully landscaped yard with boulder outcroppings, stone pathways, hot tub, and wonderful fire pit. This extraordinary home is currently a fantastic luxury vacation rental. The Lodges at Eagles Nest offering amenities like no other is also located minutes from downtown Banner Elk and a short drive to Beech, Sugar Mountain, and Boone.